GMB Credit Union is regulated by the FCA (Financial Conduct Authority) and the PRA (Prudential Regulator Authority). Member savings are fully protected up to £75,000 by the FSCS. 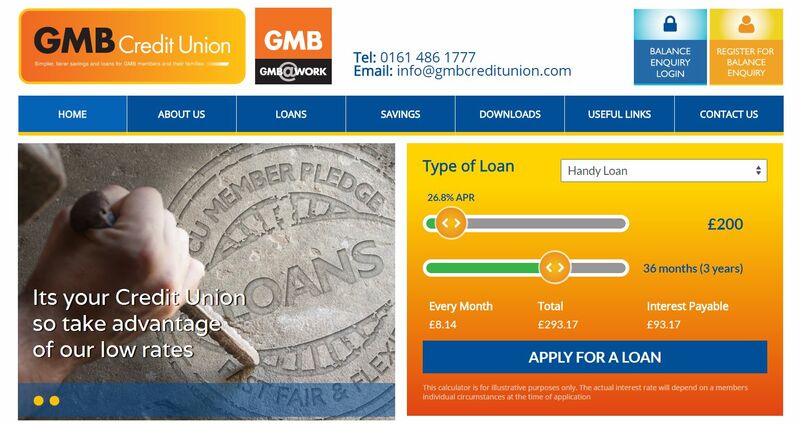 GMB Credit Union trading surpluses are returned to members as an annual dividend on savings and reinvested in the Credit Union to ensure that we deliver competitive savings and loan services for all GMB members. Loan applications are consider on an individual basis and interest rates will depend on individual circumstances and the loan amount requested. Loans are assessed on a member's ability to repay. We may request additional supporting information and search and share credit information with credit reference agencies. Members must hold or open a Credit Union member savings account and save an agreed amount; minimum £5.00pm; while repaying their loans. This is an easy access savings account which all members open when joining the credit union. Credit Union savings are fully protected by the Financial Services Compensation Scheme up to £75,000. A competitive dividend recommended by the credit union Board and approved at the AGM is paid annually on Member and Junior savings accounts. Stay in touch with your savings through our online balance enquiry or request a statement as required. Credit unions let people in a local community or other organisation save and borrow money. There are nearly 450 credit unions in Britain, so almost everyone has access to one. There are also work-related credit unions, for example for employees of the NHS, trade union members and employees in the passenger transport industry. How are credit unions run? Credit unions are owned and controlled by their members, so they have no outside shareholders to pay. They are run by volunteers elected by the membership. Any profit that a credit union makes is used to develop the credit union and provide a return to savers. In June 2012, the government announced plans to invest £38m over the course of three years to make credit union services available to one million more people. Currently just 2% of people in the UK are members of a credit union, compared to up to 75% in Ireland. Are my savings safe with a credit union? Credit unions are licensed deposit takers, authorised and regulated by the Financial Conduct Authority. Just like ordinary savings accounts, they are fully covered by the Financial Services Compensation Scheme (FSCS) up to the standard limit of £85,000 per individual. Can I earn interest on my savings? Previously, credit unions could not pay interest on savings, only a retrospective dividend. Credit unions can now pay interest on savings, which means it will be easier for people to compare the rates of return with other savings providers and will help credit unions attract more savers. Why would I want to borrow from a credit union? Credit union loans can be a flexible alternative to mainstream banks and lenders and usually operate to the mutual benefit of members and communities. Loans from credit unions are generally cheaper than loans from most other providers for smaller amounts and do not incur set up fees, administration costs or early redemption fees. Some credit unions may charge more than this, although by law the amount of interest charged by a credit union can be no more than 2% a month on the reducing balance of a loan (an APR of 26.8%). In Northern Ireland the maximum is lower still at 1% a month on a reducing balance (equivalent to 12.68% APR). What are the benefits of a credit union loan? Credit unions offer very competitive rates of interest on personal loans of up to about £3,000 and are happy to offer much smaller amounts. Interest is charged on the reducing balance of the loan. This is important if you want to repay your loan weekly rather than monthly as you'll pay less interest overall. When you borrow from a credit union, you can pay back loans through various channels such as straight from your wages through payroll deduction, taken from your benefits if you pay them into the credit union through the PayPoint network, from your bank account by direct debit or with cash at local offices or collection points. Credit union loans come with no hidden charges and no penalties for repaying the loan early. When someone borrows from a credit union, they are encouraged to save too, meaning that by the time they finish repaying the loan their savings will have grown as well. Most credit unions are happy to lend small sums, but more and more credit unions are also providing larger-sum credit for big purchases and in some cases even mortgages. In general, credit unions will provide personal loans for up to five years and up to 10 years for a loan secured on a borrower’s property. However, some are able to lend up to 10 years for an unsecured loan, and up to 25 years for a secured one. Traditionally, to borrow from a credit union you had to have saved with it first. These days, however, many credit unions do not insist on this.